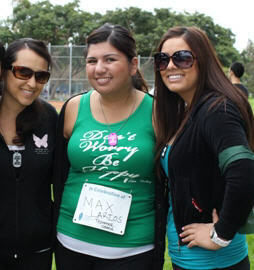 Smart Circle employees are helping make the future a bit brighter, happier and hopeful for cancer warriors. 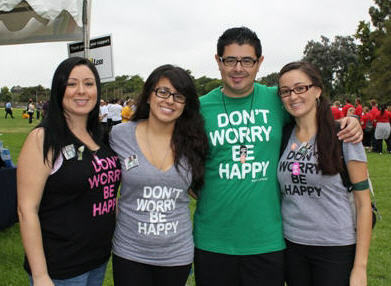 Smart Circle is proud to announce that 10 of its employees from its corporate office in Foothill Ranch have united together to support the Don’t Worry, Be Happy (DWBH) Shirts Foundation, a nonprofit organization focused on helping struggling cancer warriors pay their medical bills. Smart Circle commends the extensive volunteer efforts of its dedicated employees, who participated in a variety of events through the foundation over the past year to help struggling cancer patients afford the treatment they need and deserve. Notably, 10 Smart Circle employees served as members of the DWBH team at the Brain Tumor Walk on Saturday, September 17, 2011 at Mile Square Regional Park in Fountai n Valley. The Smart Circle team walked in support of Smart Circle employee Erika Larios and her family, who lost her father to cancer last year. Smart Circle is proud to recognize Erika Larios, Josie Yerenas, Lindsey Garrison, Gina Gannon, Laura McLoud, Michelle Morales, Ivan Scherer, Brandy Jones, Banh Hy and Wendy Gonzales for their efforts at the event. The Don’t Worry, Be Happy Foundation and shirts were inspired by Kevin Carlberg, a successful musician who was diagnosed with brain cancer when he was 26, and miraculously survived six years longer than expected. Throughout his struggle with cancer, he held the mantra “Don’t Worry, Be Happy.” The foundation was launched to carry his message of hope and happiness to individuals facing life threatening diseases and their families. Currently, the foundation’s mission is two-fold: to spread the “Don’t Worry, Be Happy” philosophy to children struggling with cancer at camps and hospitals, and to pay the bills of financially-struggling cancer warriors. Employees will continue to support the organization, cancer warriors and their families throughout the upcoming year through events and/or donations. For more information about the DWBH Shirts Foundation, please visit http://dwbhshirts.com/. A Hard Rock Celebration of Excellence In Cancun! A Big Thank You From The Los Angeles Angels!